NEWS - CONTINUED 38 E&MJ • APRIL 2018 www.e-mj.com NEWS - CALENDAR OF EVENTS MAY 6-9, 2018: Canadian Institute of Mining (CIM 2018), Vancouver, British Columbia, Canada. Contact: Web: www.cim.org. MAY 14-17, 2018: 2018 Economic Evaluation & Investment Decision Methods, Colorado School of Mines, Golden, Colorado, USA. Contact: Web: https://csmspace.com/events/econeval/. MAY 19-28, 2018: ALTA 2018 Nickel-Cobalt-Copper, Uranium-REE-Li & Gold-PM Conference & Exhibition, Perth, Australia. Contact: Web: www.altamet.com.au/conferences/alta-2018/. MAY 29-31, 2018: Peru Gold & Silver Symposium, The Westin Lima Hotel and Convention Center, Lima, Peru. Contact: Web: www.snmpe.org.pe. JUNE 4-8, 2018: Elko Mining Expo, Elko, Nevada, USA. Contact: Web: www.elkocva.com/major_events/elko_mining_expo. JUNE 5-8, 2018: Ugol Rossii & Mining, Novokuznetsk, Russia. Contact: Web: www.ugol-rossii.com/. JUNE 12-14, 2018: Euro Mine Expo, Skellefteå, Sweden. Contact: Email: jaana.tengman@euromineexpo.com; Web: www.euromineexpo.com. AUGUST 6-8, 2018: Diggers and Dealers Mining Forum, Kalgoorlie, Western Australia. Contact: Web: http://diggersndealers.com.au. SEPTEMBER 10-14, 2018: Electra Mining Africa, Expo Centre Nasrec, Johannesburg, South Africa. Contact: Web: www.electramining.co.za. SEPTEMBER 20-22, 2018: China Mining 2018, Tianjin Meijiang Con- vention Center, Tianjin, Peoples Republic of China. Contact: Web: www.chinaminingtj.org. DECEMBER 3-7, 2018: American Exploration & Mining Association annual meeting, Spokane, Washington, USA. Contact: Web: www.miningamerica.org. 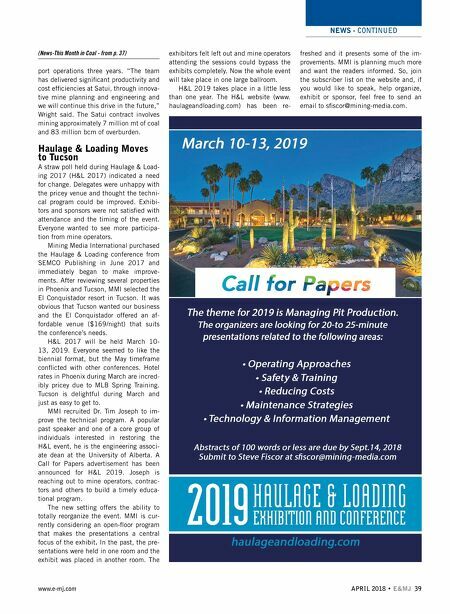 MARCH 10-13, 2019: Haulage & Loading, Hilton El Conquistador Resort, Tucson, Arizona, USA. Contact: Web: www.haulageandloading.com. 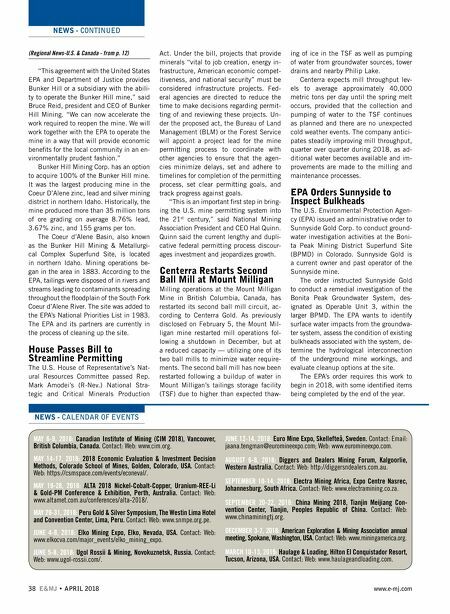 (Regional News-U.S. & Canada - from p. 12) "This agreement with the United States EPA and Department of Justice provides Bunker Hill or a subsidiary with the abili- ty to operate the Bunker Hill mine," said Bruce Reid, president and CEO of Bunker Hill Mining. "We can now accelerate the work required to reopen the mine. We will work together with the EPA to operate the mine in a way that will provide economic benefits for the local community in an en- vironmentally prudent fashion." Bunker Hill Mining Corp. has an option to acquire 100% of the Bunker Hill mine. It was the largest producing mine in the Coeur D'Alene zinc, lead and silver mining district in northern Idaho. Historically, the mine produced more than 35 million tons of ore grading on average 8.76% lead, 3.67% zinc, and 155 grams per ton. The Coeur d'Alene Basin, also known as the Bunker Hill Mining & Metallurgi- cal Complex Superfund Site, is located in northern Idaho. Mining operations be- gan in the area in 1883. According to the EPA, tailings were disposed of in rivers and streams leading to contaminants spreading throughout the floodplain of the South Fork Coeur d'Alene River. The site was added to the EPA's National Priorities List in 1983. The EPA and its partners are currently in the process of cleaning up the site. House Passes Bill to Streamline Permitting The U.S. House of Representative's Nat- ural Resources Committee passed Rep. Mark Amodei's (R-Nev.) National Stra- tegic and Critical Minerals Production Act. Under the bill, projects that provide minerals "vital to job creation, energy in- frastructure, American economic compet- itiveness, and national security" must be considered infrastructure projects. Fed- eral agencies are directed to reduce the time to make decisions regarding permit- ting of and reviewing these projects. Un- der the proposed act, the Bureau of Land Management (BLM) or the Forest Service will appoint a project lead for the mine permitting process to coordinate with other agencies to ensure that the agen- cies minimize delays, set and adhere to timelines for completion of the permitting process, set clear permitting goals, and track progress against goals. "This is an important first step in bring- ing the U.S. mine permitting system into the 21 st century," said National Mining Association President and CEO Hal Quinn. Quinn said the current lengthy and dupli- cative federal permitting process discour- ages investment and jeopardizes growth. Centerra Restarts Second Ball Mill at Mount Milligan Milling operations at the Mount Milligan Mine in British Columbia, Canada, has restarted its second ball mill circuit, ac- cording to Centerra Gold. As previously disclosed on February 5, the Mount Mil- ligan mine restarted mill operations fol- lowing a shutdown in December, but at a reduced capacity — utilizing one of its two ball mills to minimize water require- ments. The second ball mill has now been restarted following a buildup of water in Mount Milligan's tailings storage facility (TSF) due to higher than expected thaw- ing of ice in the TSF as well as pumping of water from groundwater sources, tower drains and nearby Philip Lake. Centerra expects mill throughput lev- els to average approximately 40,000 metric tons per day until the spring melt occurs, provided that the collection and pumping of water to the TSF continues as planned and there are no unexpected cold weather events. The company antici- pates steadily improving mill throughput, quarter over quarter during 2018, as ad- ditional water becomes available and im- provements are made to the milling and maintenance processes. EPA Orders Sunnyside to Inspect Bulkheads The U.S. Environmental Protection Agen- cy (EPA) issued an administrative order to Sunnyside Gold Corp. to conduct ground- water investigation activities at the Boni- ta Peak Mining District Superfund Site (BPMD) in Colorado. Sunnyside Gold is a current owner and past operator of the Sunnyside mine. The order instructed Sunnyside Gold to conduct a remedial investigation of the Bonita Peak Groundwater System, des- ignated as Operable Unit 3, within the larger BPMD. The EPA wants to identify surface water impacts from the groundwa- ter system, assess the condition of existing bulkheads associated with the system, de- termine the hydrological interconnection of the underground mine workings, and evaluate cleanup options at the site. The EPA's order requires this work to begin in 2018, with some identified items being completed by the end of the year.